Of the many questions I am asked by gardeners during consultations, seminars and social gatherings, the most frequently posed is: “When should I prune my lilac?”, often quickly followed by, “How do I prune my lilac?”. These are both very good questions because the well-timed, correct pruning of this beloved shrub will result in neater shaped lilacs and more blooms in the coming year. To begin, the basic principles of pruning should be observed. I recommend starting with my earlier post, Pruning Trees and Shrubs in the Garden for Beginners. When pruning any plant, a gardener should take care to time the pruning correctly, and to step back and observe the overall shape and condition of the specimen before cutting. The correct time to prune lilacs is right now, in mid to late June just after the flowers have faded, but before new woody growth begins. Why? Prune your lilac any later than the Fourth of July, and you will risk cutting away next year’s blossoms. Next spring, your lilacs will flower from the blossoms set on this year ‘s growth, (the green new wood). So it is important to finish up this year’s lilac pruning right away. There are two types of lilac pruning I will cover here. The first is simple annual pruning for young lilacs and regularly maintained mature specimens already in good shape. The second type of pruning I am frequently asked about, and will review, is renovation pruning. This second type of pruning is more labor-intensive, and is best spread-out over three seasons for the safety of the shrub. To keep a young, or properly maintained older lilac looking great, and to direct energy toward new growth, (and next year’s bloom), it is best to remove spent flower heads soon after they have faded, (see photo one). 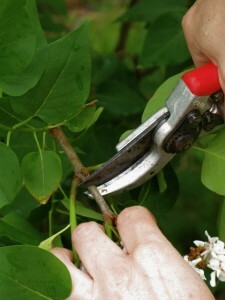 To prevent tearing, remove the old blossoms with sharp, clean bypass pruners. Make your cut straight-across, and very close to the opposite branches below the browning stem, (see photo two). Photo one: pruning out faded lilac blossoms. Next, if the shrub is more than a few years old and beginning to look over-crowed at the base, cut some of the old stems out. Make these cuts as close to the ground as possible, and at a slight angle to shed water. 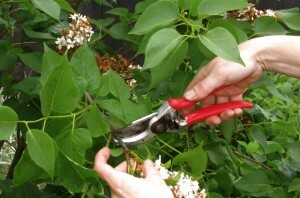 Cut out any young, new stems that rub or cross, and/or cause congestion at the base. Retain the strongest stems and remove the spindly, diseased and weak, as they will detract from the attractive structure and shape of the lilac. If the lilac has produced some extra tall stems, spiking up and distorting the shape of the shrub, shorten these stems down to the strongest branch. After each cut, stand back and observe your progress. If the lilac is a specimen shrub in a perennial garden, try to aim for a neat, natural vase shape, (slightly narrower at the base and spilling out toward the top). Properly pruned, the base of a lilac can be an attractive, verdant background for perennials in a mixed-border. If the lilac is part of a loose hedge, more growth toward the base of the plant may be desirable for privacy. In all circumstances, it is very important to remember the natural shape of lilacs. Never prune with shears, or attempt to force lilacs into boxy shapes. Square pruning is best left to boxwood, privet, yew and other formal hedge-shrubs. Renovating a very large, older lilac is a more labor intensive task, and it should be addressed in stages. Often, the new owner of an old, neglected farm will also inherit an overgrown lilac hiding the house! 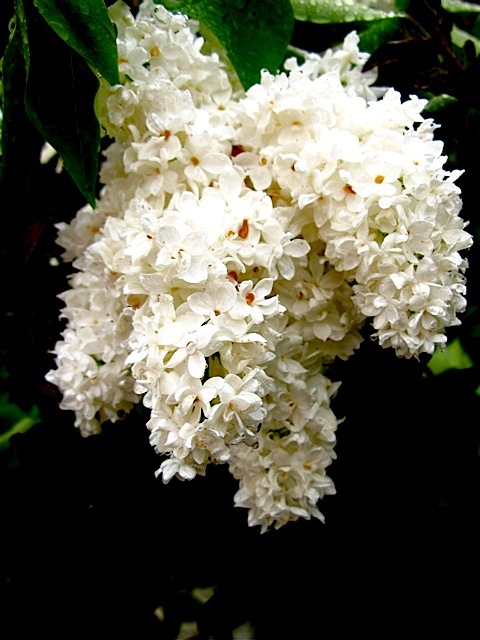 Whether an old lilac is part of a larger hedge or one wildly-suckered specimen, the renovation process should be spread out over three years, with no more than a third of the lilac removed each year. The goal is always to bring the shrub back into context with the garden and house, and to bring the blossoms closer to nose-level. The first year, have a good look at the hedge or specimen. Look for stems and branches jutting out away from the main core of the plant or hedge. Cut wayward, leaning stems to the ground and shorten branches aiming horizontally or drooping out from the shrub. These stems and branches are usually quite thick, and will require use of a grecian saw or bow saw. In some cases, an arborist’s chain saw may be required, and a gardener may need some assistance. Next look the tallest stems and branches within the shrub. Over the next three years, the overall framework of the shrub can be reduced by cutting branches back by a third and removing about a third of the older stems right to the ground. This task will likely involve ladders, and for safety it should always be considered a two person job. Once a third of the old wood has been removed, remove a third of the new stems, (shoots at the base), as well. Select strong young stems to form the new framework of the shrub, and remove any spindly, weak stems and all of those crossing, rubbing or very close together. If pruning is accomplished before July 4th, and held to the 1/3 rule, the lilac should bloom normally or better the following year. Each June, continue to prune the lilac in this manner until the framework is back in context with the home or the desired hedge-shape. Once the desired shape has been achieved, the lilac should be lightly pruned in June, just after blooming, as outlined under annual maintenance pruning above. For further information on the pruning of lilacs and all woody trees and shrubs, I highly recommend Lee Reich’s The Pruning Book, from Taunton Press. All of Reich’s books on pruning are easy to read, with many photographs and drawings to help you learn to cut with confidence. You are currently viewing the archives for Thursday, June 18th, 2009 at The Gardener's Eden.